Becky Moder is the owner of a fast growing business called Wall Surprises! Her company slogan, "Creating the WOW FACTOR with decorative and faux finishes" says it all. Or nearly all. She also paints furniture, cabinets, tiles and clothing. And she does most of this all by herself. Moder has a base painter who she keeps busy on a part time basis but otherwise, she is the whole company. She laughs and says gift giving within the company is easy at holiday time...she buys herself exactly what she wants! Her energy at 55 is amazing and when asked about retirement she smiles and promises to semi retire in 20 years. She is ready to leave Phoenix in the summer though and is scouting out a location that would offer ocean breezes. A native of Arizona and daughter and granddaughter of artists, Moder's passion to paint on walls began in 1979 in Scottsdale, AZ where she was hired for her first mural which was mimicking tiny mosaic cabinet pulls to a kitchen soffitt. Next came a beauty salon that hired her to paint antiques on a faux shelf, a church nursery where she painted elephants and then a gigantic quilt on a wall that was custom designed to look like fabric. She has added thousands of creative touches to walls along her 28 year artistic journey. 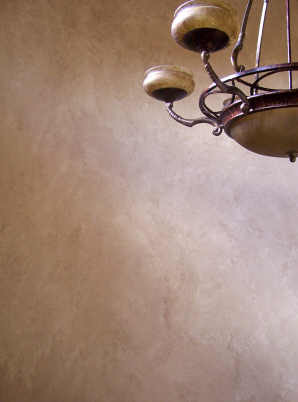 Western washes, faux leather, skip frottage, faux stacked stone and metallic are her five most requested wall finishes. Her favorite murals involve children's rooms but she paints in every room of residences and businesses across the country but primarily in Arizona. She has painted for hospitals, doctor offices, beauty salons, restaurants, wedding venues, retail establishments and recently quite a few exterior murals which are very popular in Phoenix backyards. She is about to begin work in a baby store in Glendale Arizona where she will match upscale bedding in 2 vignettes. The store will also carry her private line of baby accessories called "BECKTORIA BABY", which are all custom ordered one of a kind pieces. She says that this opportunity is a dream come true for her and she is hoping to begin the work very soon. Moder has another company called Do Overs which ties in very nicely with Wall Surprises! Do Overs is a redesign business where she uses only the customers existing furniture and accessories and rearranges everything for them. The finished room is not only beautified with a wall treatment or mural but it looks like a whole new room. Moder has a design background but never completed her education as life took over and she moved right along the path with it. And speaking of training: Moder has never had formal art training of any kind. She credits her grandmother and mothers natural abilities as being handed down the gene pool. She took high school art classes for four years where she experimented and says she drove her teacher crazy. Moder likes to think outside the box and creates and recreates wall finishes constantly. While living in Tulsa in the early seventies she signed up to take a Tole painting class and within weeks was teaching the class herself. She is a constant reader and has an extensive library of books on decorative finishes and mural painting which she uses when she is stumped. She has learned to use problem walls as a stepping stone for new creations in her finishes. About a year ago Moder was hired to create wall finishes in nearly every room of a newly constructed home where the paint she had specified was not used. In order to help her client from having extra costs, Moder created a 'skip frottage' that she now uses on many new walls painted with a flat sheen. She says it works even better on satin sheen but this has become a life saver for her. Several months ago she came up with another trick for a brand new custom home with flat sheen walls: She had her base painter paint all the walls with a satin sealer and she went to work creating five different finishes including a soft color wash that showed no lap lines at all. "I adore that sealer" she commented happily. She has figured out how to do a type of lazure finish and is just waiting to find the right walls to work on. One of Moder's favorite places to be is her 20' by 20' studio, also known as THE GARAGE. She loves to create and experiment in order to be able to offer her clients the newest and most fun finishes she can do. last on the list of to-do's for this busy artist.